Cleckheaton suffered defeat on their trip to Bridlington. 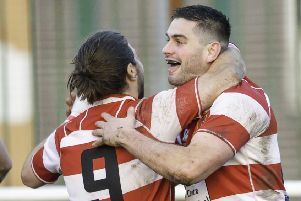 Cleckheaton suffered a disappointing day on the east coast as they began the new year with a 29-5 defeat away to Bridlington in North One East. Bridlington also gained revenge after they had lost out in a close fixture at Moorend earlier in the season. Cleckheaton made a bright start, playing with a cool breeze at their backs, and put the home side under pressure. Strong defence, which was a feature of the game, kept Cleck out and when home captain Jamie Martin turned possession over, Gareth Roberts, Paddy Waines and Josh Thundercliffe took play to the half way. Matiu Welch chipped to the corner and Jimmy Thompson won the line-out, before Jamie Martin broke. Cleckheaton were caught offside and Stevie Mellonby kicked the penalty for the opening points. From the kick-off Welch cleared and good interplay took them to the line, though Waines was held up. From the scrum a neat training-ground move saw newly-wed Gary Stevens scorch through to score a converted try to make the score 10-0 to the hosts after 25 minutes. Cleckheaton spent the last 15 minutes of the first half with most of the possession, but excellent defence from Otis Floyd, Roberts and Martin, kept the visitors out, and eventually Floyd turned over possession. Bridlington attacked strongly showing no after-effects of over-celebrating Stevens’ wedding day festivities and when Thompson won a lineout, Waines and the elusive Floyd both went close. Brid won the scrum and that led to the powerful Thompson scoring and making it 17-0. Martin and centre partner Roberts both made powerful breaks to give Brid momentum and they went in 17 points to the good at the break. Cleckheaton, now playing into the breeze, started the second half in determined fashion, and again had a long spell of pressure but they were one more thwarted by excellent defence and Bridlington eventually regained possession. Cleckheaton were handed another opportunity from a missed touch-kick and this eventually winger Mikey Hayward scored in the corner to trim the lead. Brid desperately handed possession over to Cleckheaton, handing the visitors more opportunities to attack. Once again, they found Bridlington’s defence in outstanding form and the home side were given breathing space when Dewi Roberts burrowed over to score and Mellonby converted superbly from the touchline for a 24-5 lead. Cleck never gave up but with all their possession they were rather predictable and Bridlington’s defence held firm. Sizwe Zondo won possession and Welch kicked long, but Stevens couldn’t win the race to the line. Cleckheaton had another chance but Zondo, now in the centres as Alex Shipley had come on to replace the injured Gareth Roberts, made a tackle and a long kick from prop Thundercliffe saw Callam Sanderson chase from the ruck. Dewi Roberts broke a fed Callum Cappleman who came on for Waines, and he scored the bonus-point try. Bridlington saw the rest of the game out comfortably to collect a five-point win.